I have always appreciated self portraits. Jeffar Khaldi is a tall man so he painted a very large portrait of himself, of his bust and face, which remained recognizable despite the blotches of paint splattered on his face and hair. Tied around his neck you can find a keffiyeh, and upon it the discernible effigy of a father protecting his son, and the words "we will not forget", calligraphied along it. The actual title of the self portrait is a political statement, an identity proclamation: "You Can Take A Man Out of Palestine But You Can't Take Palestine Out of A Man." Leila Shawa, Mona Hatoum, Tarek al Ghossein and Jeffar Khaldi are Palestinian and their identity transpires in their art. They never stray far from the iconography of war, politics and conflict. Take Tarek al Ghossein's photograph of a man wearing a kafiyya striding on the tarmac next to a plane that resembles the TWA model and the viewer immediately thinks of a highjacking. When I passed the threshold of Gallery Isabelle VanDenEynde, and my eyes caught a glimpse of Khaldi's immense diptych "Last Cigarette", I immediately sensed that I would linger for a long time at the show. It always happens that way for me with art: one look and I have a chemical reaction. The piece either speaks to me or it doesn't. The typically expansive expression of Khaldi is painted in Last Cigarette, dramatic and romanesque. His other self portrait is of himself as a baby, this one not political. The background, a dark khaki green, is painted in large visible horizontal brushtrokes, which carry a tremendous emotional undertone. I can just imagine him at work. "The Engineer" is another work that reflects the same energetic technique. In this instance the green shirt is left unfinished, with a downward vertical brushstroke of paint that is left to drip. 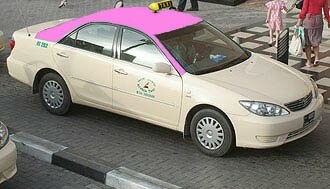 I very much appreciate a discernible technique like Khalidi's, generally more interesting than a carefully finished result. I was fortunate to hear the artist's explanations for the portrait of "The Bomber". His language was engaged, he spoke with the vigor of a politicized artist. I asked him about a Chagall looking smaller painting and he confirmed that the painting was of Chagall himself, and the recognizable newly weds he has painted flying in the sky, beside Israel's iconic leader Golda Meir. He made a point to tell me that this painting was in no way a hommage to Chagall, previously scorned by Picasso also. When I shared my old passion for Chagal, he was surprised. "Are you French?" he asked me. His question in turn took me aback, but led to an interesting conversation about Chagall's Jewish folklore. 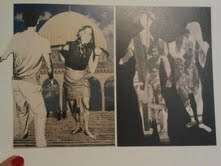 As I toured the rich show, I stopped for a long time in front of a collage diptych of Western-Jewish dancers cut from one work and glued on a background of clouds, beside the Dome of the Rock and a superimposed staircase in the other. On the right, the silhouette's of the dancing couples leave behind the image of fleeing Palestinians. Set beside Khadaffi, Saddam, Nasser, Arafat, Begin, George Bush Senior and Khomeiny all painted in a highly critical manner, the portrait of Carlos stood majestically. 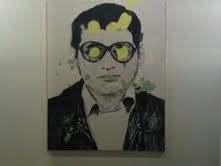 He is painted wearing his eyeglasses, a leather jacket, with blotches of paint covering his eyes, to maintain his undercover identity ,as he constantly has throughout his life. I walked out of the IVDE show, satiated. The art was entertaining, powerful and meaningful. The exhibtion was entitled "Remove the invisible veil". The exhibit captures perfectly the rising sentiment in the Middle East and North Africa. The artist calls Arafat a failure, Sadat a cockroach, Mubarak a pig, Khaddafi a Manchurian candidate, and challenges the viewer through his art to smash the idols that the viewer's been worshipping for over half a century.